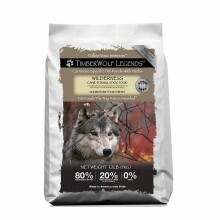 The woodlands, dogs feel a sense of being at home there, surrounded by organic living life and fauna and all of it seems to be carried in the dense forest atmosphere. The scent of pine and spruce, damp earth and sunshine after a rain storm has passed through, Its a sense of rightness and being high on nature. 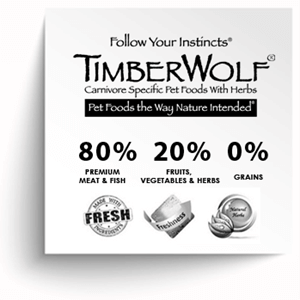 Reflecting an earthy, woodsy character, this diet captures the taste and aura of the woodlands with an earthy unsophisticated character. 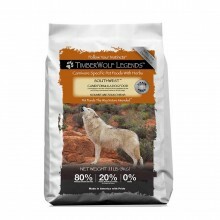 We have taken great pride and invoked a lot of passion in finding the perfect balance for our Timberwolf Black Forest LEGENDS Grain Free Formula. 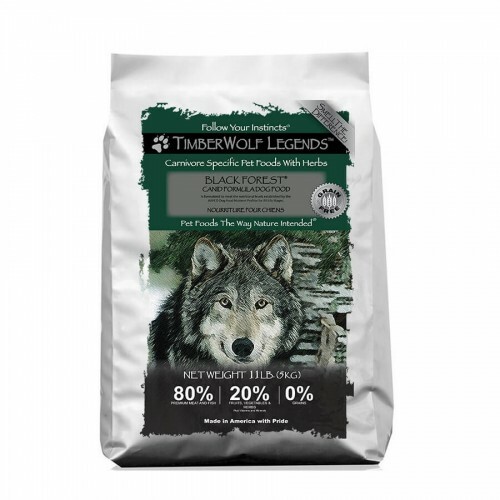 Black Forest Legends is highly useful formula for clearing up dermatologic and other conditions caused by adverse food reactions or the buildup of toxins. 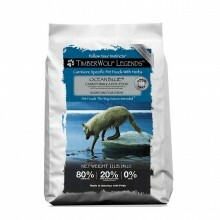 Developed with fresh New Zealand lamb and fresh deep sea cold water salmon and whitefish. 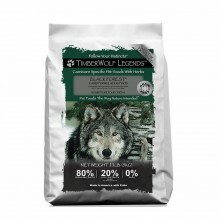 This diet includes our proprietary blend of herbs keeping with natures’ woodland characteristics. Flaxseed has good amount of protein, fiber, lignans, alpha-linolenic acid and omega-3 fatty acids, in addition to being a rich source of some vitamins and minerals. Studies have shown that the ALA in flaxseeds prevented cholesterol from being deposited in the blood vessels of the heart, reduced inflammation in the arteries and reduced tumor growth. Dehydrated alfalfa (father of all herbs), a nutritive herb that contains considerable amounts of protein and one of the richest sources of vitamins and trace minerals, such as calcium, magnesium, potassium, beta carotene, vitamins A, B12, C, D, E and K. It is also high in the antioxidant chlorophyll. Its nutritional value makes alfalfa a commonly used dietary herb for many animals. 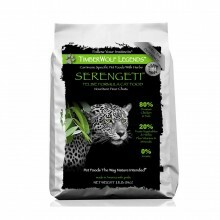 This diet is fully balanced and has high levels of omega 3 essential fatty acids, from herring oil including EPA and DHA. 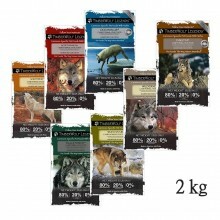 In fact, has 1.45% omega 3 essential fatty acids by weight. Research suggests that a high ratio of omega 3 to omega 6 essential fatty acids (greater than 1 to 6 omega 3 to omega 6) may lower the incidence of cancer and may even help animals with cancer live longer than they would otherwise. EPA benefits the heart and circulatory system by promoting healthy blood triglycerides and blood flow. 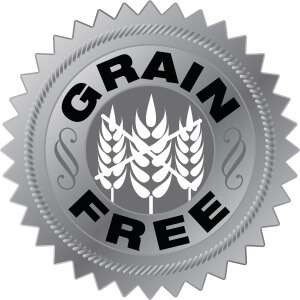 EPA also plays a role in the natural body movement of joints and can be beneficial to joint pain and inflammation. DHA is the most highly unsaturated fatty acid found in nature. DHA supports normal mental function, optimal memory, focus and learning. Higher levels of mixed tocopherols and vitamin E preserve the high levels omega 3s. 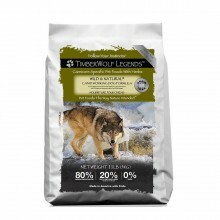 Prebiotics inulin is a natural source of soluble dietary fiber and induces the growth of activity of beneficial microorganisms, a healthy bacteria in your dogs’ digestive tract. 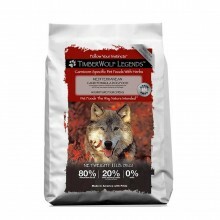 Timberwolf Legends Black Forest uses chelated minerals that are chemically attached to protein. This makes them simple to absorb. Chelation is a specific binding process that binds inorganic minerals with organic compounds to provide more stability and bioavailability. We do not put vitamin K3 (menadione sodium bisulfate) in any of our formulas because of health risks to animals and rely instead on high levels of foods that are naturally high in vitamin k1 such as alfalfa and kelp. 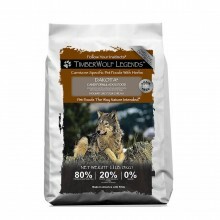 Ingredients: Lamb, Spray Dried Whiteﬁsh (Fish Hydrolysate), Sweet Potatoes, Salmon, Venision, Salmon Oil, Pumpkin, Green Peas, Flaxseed, Sunflower Oil, Dried Organic Kelp, Dried Saccharomyces Cerevisiae, Herring Oil, Dehydrated Alfalfa Meal, Red Delicious Apples, Blueberries, Blackberries, Cranberries, Dried Figs, Thyme, Ground Cinnamon, Sunﬂower Seeds, Whole Carrots, Dried Celery, Dried Beets, Dried Parsley, Dried Watercress, Dried Spinach, Tomatoes, Lecithin, Choline Chloride, Minerals: [Zinc Amino Acid Complex, Iron Amino Acid Complex, Manganese Amino Acid Complex, Calcium Pantothenate, Potassium Iodide, Sodium Selenite], Vitamins: [Vitamin E Supplement, Vitamin B12 Supplement, Vitamin A Acetate, Niacin (A Source Of Vitamin B3), Vitamin D3 Supplement, Riboﬂavin (A Source Of Vitamin B2), Folic Acid, Pyridoxine Hydrochloride (A Source Of Vitamin B6), Thiamine Hydrochloride (A Source Of Vitamin B1), Biotin (A Source Of Vitamin B7), Citric Acid (A Source Of Vitamin C), Mixed Tocopherols (A Source Of Vitamin E and A Natural Preservative)], Prebiotics: [Chicory Root (Inulin)], Probiotics: [Dried Lactobacillus Acidophilus Fermentation Product, Dried Lactobacillus Casei Fermentation Product, Dried Lactobacillus Lactis Fermentation Product, Dried Bacillus Subtillus Fermentation Product], Papain, Yucca Schidigera Extract, Beta-Carotene, Fructooligosaccharides, Taurine, L-Carnitine, DL-Methionine, Rosemary Extract (A Natural Preservative). We reserve the right to make small changes in formulations from time to time in order to improve performance. Labels on bags may vary slightly from website ingredient listing.